Managing long-term digital archive could be a challenge for almost every company. Many enterprises have regulatory requirements for retain data, and that too for decades. We all are aware that digital data is growing exponentially, and storing/managing this huge data is an operational challenge. One can use multiple data centers to store all that data but there is huge capital and operational cost. Storage systems, tape libraries, robotic storage, vendor contracts, rent, aircon and power -all that adds challenges. New, long-term, low-cost, secure and durable storage for data archival and backup. How it integrate with AWS ecosystem? What does it offer? What’s new? Very low cost as compared to any other cloud service. Glacier is definitely not about short-term planning, this is a brand new approach to data archiving that is designed to help maintain information throughout the decade and century. Glacier seems to be perfect fit for enterprises that have long-term goals in mind. This solution targets large organizations with regulatory compliance, and media,medicine and entertainment companies with large amounts of digital storage. 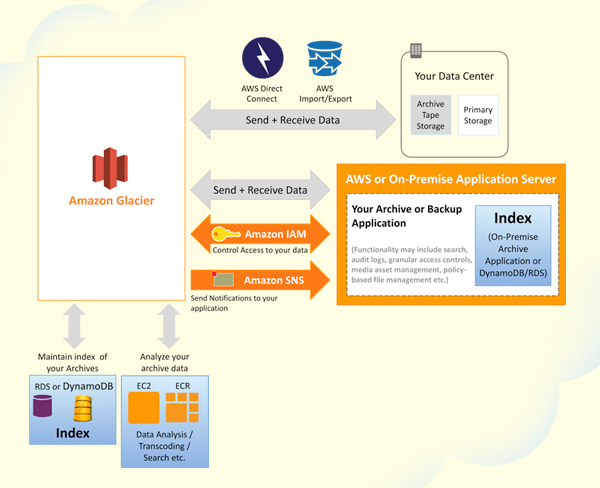 But again, keep in mind that there is nothing else that is more reasonably affordable solution than AWS Glacier.